Base of Operations: Humanity's Last Stand Complex, East Buffolk, Oklahoma. History: (Punisher III#12 (fb)) - The Mutant Liberation Front released a statement to SHIELD to the effect that the Reverend William Conover would be executed by them for being a hypocrite. SHIELD assigned agent Kymberly Taylor and the Punisher to guard Conover, and were joined by FBI agent Carl Denti (secretly the X-Cutioner). The MLF sent Deadeye to after Conover, but the Punisher drove him off. (Punisher III#12) - When Deadeye returned, the Punisher fought him across Washington, but he was finally slain by the X-Cutioner. (Punisher III#13) - Blastfurnace was sent to destroy Deadeye's body before an autopsy could be performed, which would have revealed he wasn't a mutant. The MLF then sent Corpus Derelicti after Conover at a soup kitchen, but the Punisher defeated him. Blastfurnace again appeared to destroy his body, and he set the entire building on fire. (Punisher III#14) - The X-Cutioner and Punisher destroyed Blastfurnace, and Conover's bodyguards stuck close to Conover as they transported him by train to Oklahoma. The MLF sent Burnout after Conover, and a new Deadeye to blow up the tracks in front of the train. (Punisher III#15) - Burnout caught Conover, and brought him back to Humanity's Last Stand's base. A new Blastfurnace was simultaneously sent to eliminate the remains of the previous Blastfurnace. Simon Trask prepared to have Conover brainwashed so that he would promote Humanity's Last Stand's anti-mutant message, but when Denti publicly announced that he had evidence that the MLF were not mutants, Trask sent the MLF to capture him. The Punisher and Taylor fought the MLF for Denti, but he was captured-- all according to the Punisher's plan. (Punisher III#16) - Denti escaped the MLF using his X-Cutioner technology, while the MLF's first Burnout died when her powers overloaded. The X-Cutioner brought the Punisher and Taylor back to the MLF's base, and they killed Deadeye and Blastfurnace and rescued Conover. 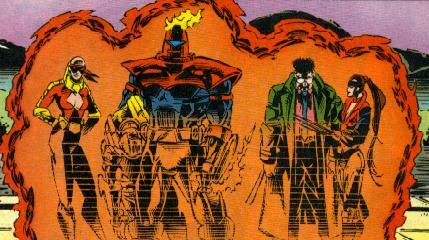 Trask killed Blindspot himself when she refused to distract the Punisher, and as he fought the Punisher, he prepared to activate an explosive device to destroy the entire compound. (Punisher III#17 (fb)) - Before the trigger could be pressed down, Thermal froze Trask's hand to the device. He shot her in retaliation, but the Punisher clubbed him with a pipe, then grabbed Thermal and ran from the compound as it exploded around them. (Punisher III#17) - Thermal was tracked down by Haskell Salaki, a U.S. marshal assigned to locate the Punisher, and he heard from her how the Punisher had brought her to safety. Comments: Created by John Ostrander, Tom Lyle, Darick Roberston, Robert Jones, and Jeff Albrecht. The Mutant Liberation Front has an entry in Marvel Legacy: The 1990s Handbook. Blindspot and Thermal received real names in the MLF profile in OHOTMU A-Z HC#8. Blindspot (Kylie Kopeikin) could generate intense flashes of light from her hands, by either chemical or technological means. She also used a teleportation device like the other MLF members. She was friends with Thermal. She was killed by Simon Trask when she refused to battle the Punisher because her family was in the Humanity's Last Stand compound.